What are WW1 War Diaries? In total there are ten separate points relating to what should be recorded in a war diary. However, I have never seen all of them recorded and you’ll get a mixture. Some of the most important documents you can find in war diaries are detailed appendices describing the actions fought. Fortunately, a lot of these are typed. If you are researching an officer, you will usually find their name mentioned in a unit’s war diary. However, the names of other ranks seldom appear, even if they are killed. I have found that war diaries from the first months of the war can be far more detailed than those appearing later and are more likely to contain information about other ranks. For infantry regiments, you can check the relevant medal rolls available on Ancestry. For cavalry regiments, their unit often appears on their Medal Index Card or can be found checking the relevant medal rolls. For soldiers who served with a Corps of the British Army (Royal Engineer, Royal Army Medical Corps, etc), the task can be a lot more difficult. If they died in the war, a soldier’s unit can appear in their entry on the Commonwealth War Graves Commission Website. Occasionally, their exact unit was recorded on their medal records. However, many soldiers would have served in multiple units of a Corps. Absent Voters Lists can be a great help but they only record the unit a soldier served with when the list was produced. 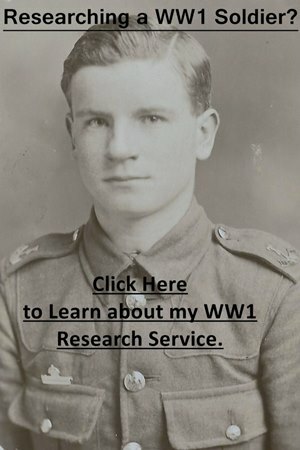 Where can I Download or View WW1 War Diaries? France and Belgium: Available to download from the National Archives and Ancestry. Gallipoli: Available to download from Ancestry. Mesopotamia: Available to download from the National Archives. East and West Africa: Available to download from the National Archives. The genealogy website Ancestry has most of the Western Front war diaries and all of the Gallipoli war diaries available to view on their website. Clicking on the banner below will take you to Ancestry. I’ve started to catalogue First World War diaries to British and Indian Army units but haven’t completed some sections yet. To see if I have catalogued the war diaries you need, click on the links below, select your regiment and go down to the war diary section. Then you’ll be able to read about which war diaries are available with links to the National Archives’ website. War diaries for the Royal Flying Corps can be found in AIR 1, though many have not survived. If a unit served in multiple theatres of war, e.g. France then Mesopotamia, their records will be found in more than one box at the National Archives. For example, the war diaries of the 89th Punjabis can be found in six different boxes. An Indian unit’s war diary can be listed under a number of different names, e.g. if you searched for Sirmur Sappers and Miners, you would miss the war diary for Sirmur Imperial Service Miners. Or if you searched 99th Deccan Infantry, you would miss the war diary titled 99th Infantry, so try a few combinations to make sure you find every available resource. However, many Indian units have large gaps in their war diaries due to records being destroyed. It can be beneficial to take out the war diary of the relevant Brigade Headquarters, as these often contain maps and operational orders which haven’t survived in a unit’s war diary. If you are researching a soldier who took part in a major battle, it is always worthwhile having a look at the war diaries of units which fought alongside them. They can sometimes contain accounts which can add to your research, as well as additional maps, reports, etc. Follow a soldier’s location through the First World War by using the place names in the diary in conjunction with Google Maps. Find out the daily activities of a unit. This can include digging trenches, marches, and when they were in the trenches, etc. If you know which company a soldier served in, there can be accounts of that particular company’s activities in the diary. When conditions were poor, there is often a record in the war diary. War diaries of units serving in Mesopotamia often record the extreme temperatures and poor living conditions. If a soldier was killed or wounded on a particular day, the war diary will provide the context of where they were and sometimes what happened. If you are researching a soldier who was awarded a gallantry medal, the military cross or military medal, the circumstances which led to the award may be recorded. If a soldier was wounded and appeared in an official WW1 Casualty List then the date they were wounded can be narrowed down. Place: Trenches near White House running E[ast] to Morto Bay. Quiet day spent in improving trenches and making a communication trench, along the back. 10.30 PM Turks commenced an attack on the trenches. The attack started against the French on the right followed by an attack on the left against the Inniskillings. There were evidently simply feints as later the whole weight of the attack was thrown against the 86th Brigade on the right as far as the Regiment was concerned there was never any real danger of the Turks being successful. Generally speaking they did not come closer than 100 [yards] and a brisk fire was maintained by both sides until morning. Our [?] machine gun directed its fire right across the front of the Lancashire Fusiliers and appeared to do great execution. On our right the Turks made repeated bayonet charges and on one occasion penetrated the line, but were thrown back with heavy loss. Throughout the night the enemy’s artillery made excellent practice against out trenches and burst their shrapnel very well indeed. Attacks continued all night. 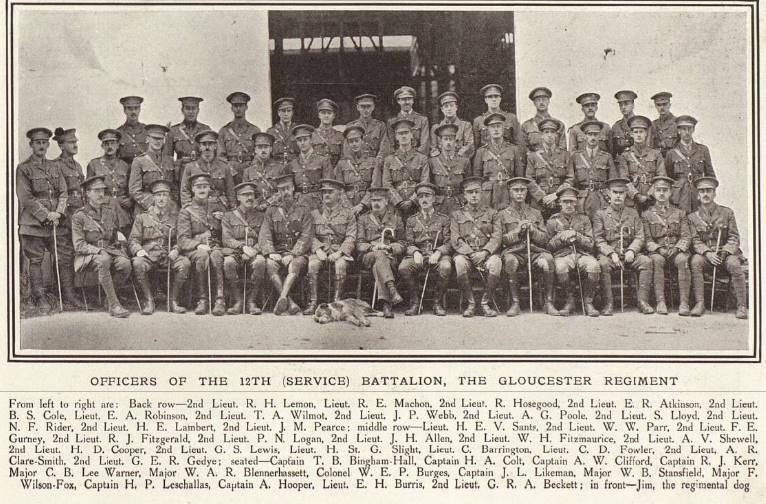 The group photograph above was taken from Tatler, 11 August 1915 and shows the officers of the 12th (Service) Battalion, Gloucestershire Regiment prior to landing in France in November 1915. If you wanted to research the officers above, then you would find many of their names recorded in the Battalion’s war diaries.